Back in 2003, the first edition of The Unsigned Guide was released; an informative directory and guide that at the time covered various sections of the music industry in the North West of England. Since then The Unsigned Guide has extensively expanded and now covers the entire United Kingdom, with the its current fourth incarnation consisting 864 pages and over 10,000 individually researched UK music industry contacts. 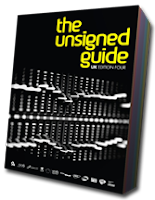 The Unsigned Guide 4 covers many sectors of the UK music industry from record labels to promoters to record shops and much, much more. The guide is a must-have for anyone involved in music; its detailed and simple structure is ideal for both bands big or small. Alter The Press! recently spoke to TUG's editor Louise Dodgson, who explained the original concept for The Unsigned Guide, how the 4th edition came together, how the guide has evolved and how it can help your band. Alter The Press: The latest edition of The Unsigned Guide is the 4th edition. How did the original concept come together? Louise Dodgson: Our national, UK-wide book is in its 4th edition. Prior to that we used to produce a North West version of The Unsigned Guide, and then spread our wings to publish a Greater London edition, before realising there was the demand for one that covered the whole country. So this is in fact our 7th edition overall. ATP: How has The Unsigned Guide developed since its first edition? LD: Well, as I mentioned before, the early editions were just centred around the North West as we are based in Manchester ourselves. So the Guide has expanded into a nationwide resource since then. We have also introduced many new sections of contact information over the years to cater to what unsigned bands need to know. Certainly, in the past few years, we have incorporated info to assist those bands who wish to follow the DIY route, so they have and advice and contacts to help them distribute and promote their music. Most recently, we have introduced a section entitled 'You & The Music Industry' which provides loads of info about setting up your own label, funding (for instance, bands can obtain funding to visit overseas music conventions such as South By Southwest), plus documents and stats explaining how labels invest in new talent these days. It’s all valuable stuff! ATP: The Unsigned Guide covers all areas of the music industry. Could you talk us through, in brief, the process of how the directory is processed? LD: It’s really quite a long and arduous task to compile an edition of The Unsigned Guide. The contact listings are the core of what we do, so every company listed in our directory is contacted by phone or email to check if they definitely want to be listed in The Unsigned Guide, and to make sure they are relevant. We get in touch with the companies listed regularly to make sure their details are still up to date, which is a massive task as we have over 8,000 companies in there. We also liaise with music industry organisations and influential companies to ask them to contribute advice and essential info for anyone trying to break into the music world. In our current edition we have contributions from BBC Introducing, IFPI, AIM, Arts Council England, PRS For Music, and many others. LD: Our online presence is massively important. The primary way that people find out about us is via the web when they are conducting searches for band managers in their area, and similar things, so it is crucial that we maintain a strong presence. We have daily news updates on the website to keep visitors up to date with developments in the music business, plus any opportunities that come about for unsigned artists to take advantage of such as festival slots, showcases, workshops. ATP: How has the guide evolved with constant changes between the music industry and the internet? LD: Well, in terms of our product we introduced an online version of the directory about a year and a half ago. It has some great search features on there, giving users the facility to quickly browse results and filter by genre if they are looking for managers, labels, publishers etc, or capacity if they are looking for suitable venues. We have loads of exciting stuff in the pipeline for our online service over the next few months so I’m really looking forward to getting the developments underway. In terms of the music industry itself, we have had to constantly adapt the Guide to make sure we keep up with an ever-changing business. Over the years we have seen more opportunities arise than ever for unsigned artists. Most festivals have slots or a dedicated stage for emerging acts, bands can get their music into online stores such as iTunes without going via a label, and these days it’s not too much of a stretch of the imagination for an unsigned artist’s music to be featured on a TV ad or a game. There’s even an entire radio station dedicated to unsigned music which simply would not have been around 5 years ago. The Unsigned Guide has kept abreast of all these developments year on year to allow users, no matter what their goal, to get the most out of it. Not everybody wants to be hugely famous, quite a lot of musicians just want to be able to make a decent living from their music, and The Unsigned Guide can help every step of the way. As I mentioned earlier, our newest section called 'You & The Music Industry' was introduced to help inform users about the effects of piracy, how the way labels invest in newly-signed artists has changed, and it provides plenty of info and stats about the music market on a global scale. It is always an advantage to have a greater understanding of the industry you are trying to build a career in. ATP: How can the guide assist a band who are just starting out? LD: The Guide can provide you with the contacts and advice for every aspect of the music business. Our aim has always been to gather and provide all the info needed, so bands can spend their time concentrating on making music, recording and playing live, rather than spending hours hunting on the internet for contacts. It really depends what direction an artist wants to go in; but whether they want to concentrate on gigging, get in the studio, or to get a bit of a buzz going with press and radio coverage – there really is something in there for everyone. ATP: At the other end of the scale. What can The Unsigned Guide do for a band, who have had a reasonable amount of success? LD: There is still plenty in the Guide for independent bands that are the next step up the ladder. If you have a bit more of a budget available, you could think about working with a great producer or getting a professional music video made. There are plenty of things the Guide has to offer artists at all levels and the listings cover a range of budgets so you can work cheaply, or move it up a level if you have more money to spend. If you are at the stage that you no longer need to do any of this yourself, then it is likely that your manager, PR company, agent, and so on will be using the Guide on your behalf. ATP: In brief, tell us why people should buy TUG? LD: In a nutshell – it is 864 pages of invaluable info about the music business. I have no doubt that you will find something of use in there; whether you’re a band or musician, starting up your own label, promoting your own nights, or trying to get a career in a particular area of the industry.